Greater Houston, Galveston area and Southeast Texas’ premier provider of vintage Rolls Royce and Bentley limousines for your wedding or special event. For wonderful pictures, we can put your new married name on the license plate. The Red San Francisco and White Trolley Buses can accommodate the wedding party, and out of town guests. Since 1982 – over 3,000 happy wedding couples. Simple to Spectacular, we do it all. 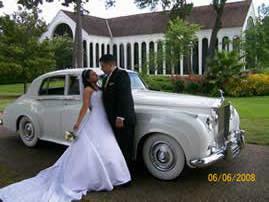 Let Jordan Limousines be a part of your special occasion to help you create lifelong wonderful memories. We Treat You Like Royalty ! Bodas y Quinceañeras en Houston? Sí, por supuesto, lo hacemos. Pregunte por Don José a 713 680-3181. SE PUEDE LEER ESTE WEBSITE EN ESPANOL. Mire arriba encima de este pagina. A la derecha de los dos anillos es un seleccion "Select Langusage" (Escoje su lengua), abiertase este y marque "Spanish" (Espanol). Entonces, todas las palabras en todas paginas estaran en Espanol. Bienvenidos a Jordan Limousines. Deseamos servirle muy bien por su dia especial.